Four years ago Chapter unveiled a stunning work of art created especially for the charity Save Wild Tigers. It was extremely sought after, raising a substantial amount of money at an auction to support the organisation’s vital conservation projects. Now, Chapter has made a very limited number of signed prints available for purchase through his website. True to the original spirit of the work, half the money from each sale will go to help the charity in its vital work. ‘When I heard from Save Wild Tigers’ founder Simon Hinton that there were only 3,200 of these beautiful creatures left in the wild I was really shocked and saddened,’ says Chapter. ‘Tigers have roamed the earth for two million years, but in ten years they could be extinct. That would be a tragedy. Inspired by the prospect of his contribution to the cause, Chapter set out to find the beauty beneath the tiger’s stripes. He discovered it in the form of one of his trademark skulls. 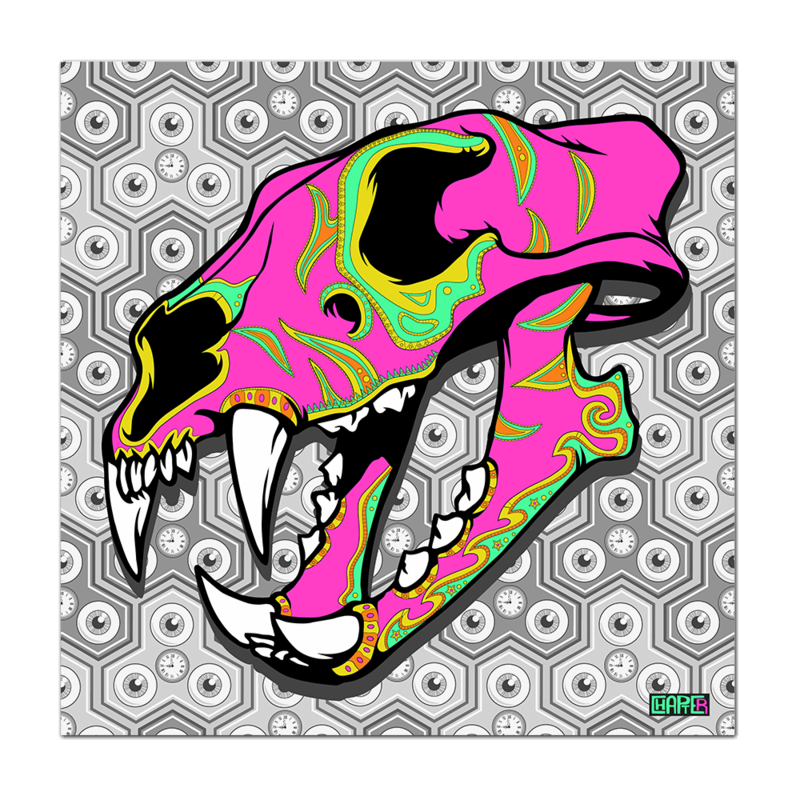 The resulting artwork features a skull embellished with Japanese graphic imagery. It’s coloured a vivid pink, the hue psychologists associate with love, safety and vulnerability. The colour is symbolic, given that the animal best-known as one of nature’s greatest predators is, underneath, so vulnerable to the activities of man. The symbolism carries on into picture’s background where frightened eyes and ticking clocks show the world watching the countdown to the potential extinction of the species. Chapter’s picture was first shown at ‘THRIVE… An inspirational art exhibition with a vision, in May 2014 at The Sanderson Hotel in London. It appeared alongside works by Lauren Baker, Bellerby and Co Globe Makers, Jane Lee McCracken, Mark Powell, Magnus Gjoen, Chiara Lisa Perano, Pampa Louzao, Cassandra Yap, Otto Schade, Clara Bacou, Rohan Chabra, Mikey Brain, Claire Bentley-Smith, Shannon Rose Lane, Chris Wright, Yanskiy, Shannon Rose Lane, Roger Hooper, Laura Lian and Gary Hodges. A signed, numbered, edition of ten copies of Chapter’s stunning image which appeared at the Save Wild Tigers exhibition is now available. Fifty per cent of the sale price goes to support the charity’s work preventing the extinction of the wild tiger across its most viable landscapes, creating an environment where it can thrive in its natural habitat, reducing demand for skins, bones and parts to end poaching. Thanks to Chapter you now have the chance to contribute to the vital charity Save Wild Tigers and be one of a very select group of people with one of these gorgeous and meaningful works of art on your wall.